Recently Theme Junkie has launched Rexus WordPress Theme and i got email yesterday from them about the news of launching this very new WordPress theme. I have seen the photos and the features of this and here below i am describing the details about Rexus theme review here. It is the very common symptom of any new design by Theme Junkie that it become very famous in few days after launching it. Fresh life is the very bi example of it. 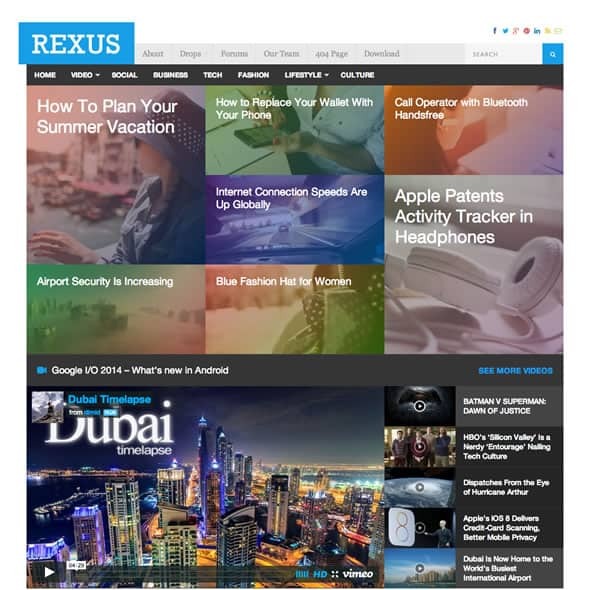 Rexus Theme works as good show case for featured posts in the form of photos and good magazine style in 2nd half of the design. Its coding is W3C standardise to run easily on any kind of web browser like Firefox, Safari and Internet Explorer etc. Ad management system is really amazing You can place various size of banner images in your sidebar and banners to other built-in ad positions with ease. This is localisation ready which means you can translate any language using .po and .mo file easily. You can read about thrive themes review here and thrive content builder tutorial also for making your blog more converting and result oriented also.